They are made from chemical free brown rice in the Korean first clean tech area, Eco City Yangpyeong. As it is not fried oil, it has soft and mild taste. 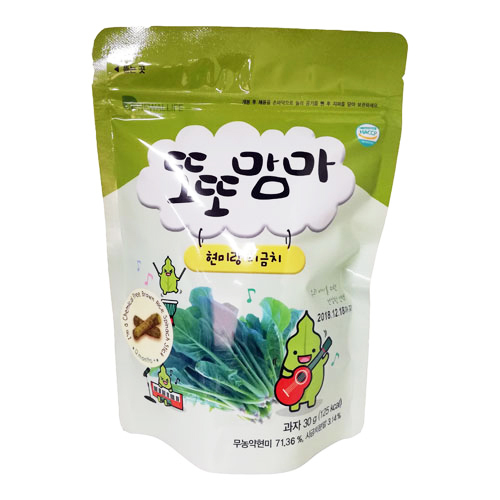 It's coated with highest quality spinach powder and it is the best eco-friendly snack which maintains the nutritional ingredients for your family. Ingredients : Brown rice(Korean) 68.86%, Renewal white[organic sugar62.4%, cocoa butter(Singapore),mixed skimmed milk powder(skimmed milk, whey powder : Dutch/milk), Lecithin(soy bean:emulsify)] 24%, Spinach powder(Korean)2.14%, Yogurt powder(French), organic sugar 2.15%, SeaweedCalcium(Ireland)0.8%.